The set of Cactus Flower is dark. A young woman is splayed on her bed while her radio blares. A man knocks against the wall, yelling over the music. He smells gas. He climbs through her window, turns off the gas and tries to wake her. She believes he’s her lover and he kisses her. My stomach churns as the audience laughs. When she’s awake she complains how she “fizzled” her own suicide. The audience laughs again. Even with the lights on, the play is pointedly dark. It makes sense. The show’s title is about a prickly plant that can still reveal a little sweetness. The “cactus flower” is supposed to be nurse Stephanie Dickinson, a strict nurse who is more than meets the eye. I think the title can also refer to the play itself. The content is prickly: a slimy older man going after a naive young woman, who attempts suicide when she believes his wife and kids will always be his number one priority. In the midst of all the seediness, the show is still funny. I liked the little bit of sweetness that came out of it. You may recognize the story from the movie of the same name from 1969 with Walter Mathau, Ingrid Bergmen and Goldie Hawn. For those with more recent taste, the movie was adapted into an Adam Sandler comedy Just Go With It in 2011. The play typical comedy plot about a person digging themselves into too deep of a hole with their lies. Dr. Julian Winston who spins fib after fib about his fake marriage in order to stay with his young girlfriend Toni. Winston convinces his loyal nurse Stephanie Dickinson to play his fake wife. The plan appears foolproof to Watson, but sure enough it works against him every time. Harry Hochman as Dr. Julian Winston did well as a sleazy shmuck. I really believed he had no idea that faking a marriage and children would end up poorly. His charm as a silver fox was underplayed, but his genuine cluelessness brought out the laughs. Charlotte Tavenor is endearing as Winston’s naive lover, Toni Simmons. My absolute favorite performance was by Silvina D’Alessandro as Stephanie Dickinson. Her jokes were delivered with sharp wit. Whether she was being funny or sweet, she felt sincere as a character from start to finish. She was wonderful to watch. Prepare for a long viewing. The show goes on for three hours with intermission. If you can handle the long sit, then I recommend you buy a ticket. The show is a classic comedy of mishaps and love swaps. The jokes are funny, the set is fantastic, and the music will take you back in time. 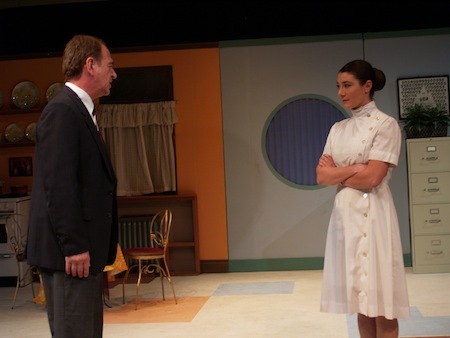 Cactus Flower (Scarbourough Theatre Guild) at Scarborough Village Theatre, 3600 Kingston Road. Shows run September 6th, 11th, 12th, 18th, and 19th at 8 pm, and the 14th and 20th at 2pm. Regular tickets are $20, while student/senior tickets are $17. The tickets can be ordered through the box office number 416-267-9292. You can check out the seating plan online. Photograph of Harry Hochman and Silvina D’Alessandro by Julie Adams.